After a collision, you need to obtain compensation from the insurance company quickly and cost-effectively. The attorneys at Faerber & Anderson, P.C., have over 40 years of experience with truck and car accident claims and investigations. We have the trial experience, knowledge of the law and reputation to deal effectively with insurance claims representatives and their lawyers. With over 55 years of combined experience, our team of lawyers understands what it takes to build an effective personal injury case for a truck or car accident victim. We aggressively pursue full and just compensation on behalf of our clients and, over the course of our practice, we have earned over $40 million in financial compensation for our clients. If you live in or near St. Louis, Missouri, and need representation you can trust in a personal injury case, contact our office. We are also licensed to serve individuals in Illinois and Arkansas. Our firm obtained $2.1 million for the victim of a garbage truck accident, who suffered brain damage after spending weeks in a coma. Before the family hired Faerber & Anderson, P.C., the trash company tried to limit the victim’s recovery to the minimal amount available under workers’ compensation laws. View other verdicts and settlements we have won for our clients. At Faerber & Anderson, P.C., we have been pioneers in proving that even low-impact accidents can cause serious injuries, especially when one, or both, of the vehicles is a heavy-weight truck. Sometimes the most serious accidents involve only minimal damage to the semi-truck, because it is so much heavier than a normal car. 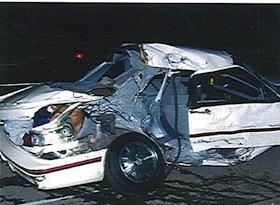 The damage to the white car pictured here was caused by the minimally-damaged red truck pictured above. 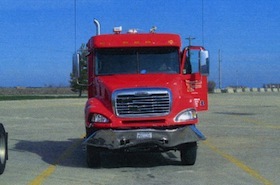 Faerber & Anderson, P.C., obtained $225,000 for a truck accident that involved a client who was driving a semi-tractor that was rear-ended by another semi-tractor trailer. Even though it was a low-speed accident, it caused significant knee and shoulder injuries. View other verdicts and settlements we have won for our clients. Our attorneys have the investigative skills and trial experiences needed to prove negligence and obtain compensation for injuries related to truck and car accidents. Our lawyers will go to great lengths to build the best possible case on your behalf. We work with a team of experts that includes life-care planning experts and accident reconstruction specialists.